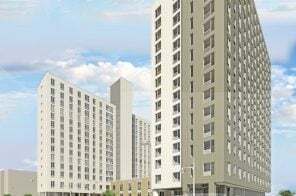 The smaller tower in Related Companies’ High Line-straddling project has topped out. 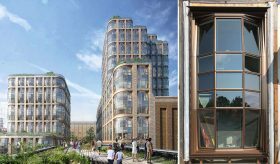 The two matching condo towers at 555 West 18th Street, one on either side of the elevated park, were designed by Heatherwick Studio as their first residential project in Manhattan. 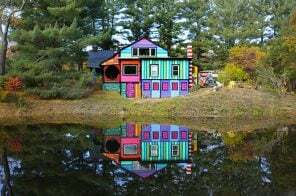 The duo has become know as the “bubble towers” for their bulging bay windows, that not only give the appearance of a building covered in bubble wrap but provide for interesting views of the park and Hudson River. 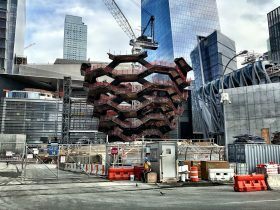 In April, construction began on Hudson Yards’ Vessel, a 150-foot-tall steel structure designed by Heatherwick Studio and its 100,000 pound-components were put in place by crane. The $200 million “public landmark” began to rise in August and now the structure’s construction has hit its halfway mark. The project’s idea comes from Related Companies’ chairman Stephen Ross, who called it the “365-day Christmas tree.” The climbable Vessel will be the centerpiece of the Public Square and Gardens, five-acres of greenery that will connect the buildings of Hudson Yards. The structure includes 154 geometric-lattice linked flights of stairs, 80 landings and will able to hold 1,000 visitors. It was nearly three years ago that Related Companies chairman Stephen Ross boasted that Hudson Yards‘ public art piece would be “New York’s Eiffel Tower,” and after an unveiling today of the massive sculpture that will anchor the central public space, it seems he might not have been too far off. 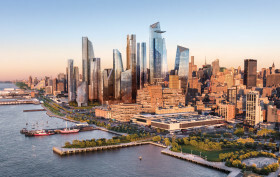 On the heels of the news that Hudson Yards will add $18.9 billion to the city’s GDP and the reconfirmation that the developers will build an iconic $200 million sculpture at the center of the plan’s plaza, Related quietly launched a new Hudson Yards Living website, providing general information for prospective residents and a few new images of the $20 billion master plan. It’s been relatively quiet over the past six weeks or so as far as news about the proposed offshore park and performance space in the Hudson River known as Pier55. 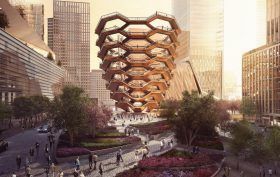 But this week, Community Board 2’s Parks and Waterfront Committee reviewed the project, and though they liked Thomas Heatherwick’s design overall, they cited their main concern as transparency. 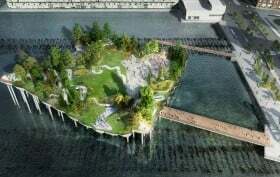 Last week, news broke that billionaire media mogul Barry Diller had been working with the Hudson River Park Trust for the past two years on an idea for an offshore park and performance space in the Hudson River. And though it seemed far-fetched at first, the fact that Diller had personally committed $130 million to the project and that detailed renderings had been created made it see much more plausible. Floating space in New York’s waterways is not a new concept. 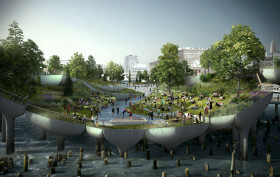 Take the +Pool, for example, the public pool proposed for the East River that was recently supported by Kanye West. But a new offshore park proposed for the Hudson River off 14th Street seems exceedingly ambitious, as it would cost $170 million, be located 186 feet off land, and contain wooded nooks and three performance venues including an amphitheater. Barry Diller, sponsor-to-be of this ambitious plan, gives the project a much more realistic outlook. The billionaire chairman of IAC/InterActiveCorp, former head of Paramount Pictures and Fox–and husband to Diane von Furstenberg–was the single largest donor to the High Line. 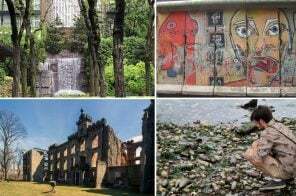 He’s pledged $130 million from the Diller-von Furstenberg Family Foundation to make the 2.7-acre park a realty, as well as agreed to run the outdoor space and cover operating expenses for 20 years. He and his wife have starchitect-designed offices in the Meatpacking District and are clearly becoming king and queen of the neighborhood.